Last night, prompted by a Dan Benjamin tweet, I felt inclined to watch one of my favorite ’80s movies, Fletch. I own Fletch on DVD (two versions, in fact), but I didn’t feel like busting them out. I wanted to watch it on my iPhone in bed, so I decided to check the iTunes Store and Netflix. Unsurprisingly, iTunes did have it, but only for purchase, not for rental. And I’m not inclined to pay $14.99 to buy a digital copy of a movie I already own twice over on disc. While on iTunes, I saw a recommendation for The Sting. Intrigued, since I have never seen it (gasp! ), I considered it as a possible alternative, and was pleased to see iTunes had it as a $3.99 rental. But before dropping four bucks on it I decided to check its availability on Netflix. I checked the iTunes Store first, because I have learned to assume Netflix won’t have what I want available for instant streaming. Or, more accurately, I have learned not to trust that Netflix will have what I want. And that’s where the problem lies: I don’t trust Netflix. It’s not that I think they’re up to anything nefarious (it’s not the same as the distrust I have these days for Google, for instance). And it’s not even entirely that I have become jaded by past experience discovering just how woefully limited their selection of streaming content is. It’s that I don’t trust their interface to really show me what’s available. Why not? They have a search box, after all. I can just search for what I want. To the best of my knowledge, the search box works pretty well. If they have something, it comes up. If they don’t, it doesn’t. So, the horrible interface for Netflix streaming on most devices is just that way to obscure how bad the selection is, right? So, again, why don’t I trust Netflix? I’ve been pondering that question all morning, and I think I have it figured out. It’s because good search, alone, isn’t good enough. Search is open-ended. It’s also kind of like standing outside a locked door and whispering through the keyhole to someone inside. You know there’s a lot of stuff inside the room. You even know that the room probably holds things you want. But you can’t see for yourself what’s inside, and the person on the other side of the door is only answering yes-or-no questions. I took a few screenshots on both the iPhone and iPad, as well as on the Netflix website on my computer, to demonstrate what I’m talking about. Well, that’s lovely. No results. OK. Did I spell it wrong? Is it case-sensitive? Am I hallucinating and this movie never even existed? Is anybody out there? OK, well… hmm. What should I do now? Maybe I should browse comedies. Really… that’s where we start? Can I fine-tune my selection a bit? Sort them into some kind of meaningful order? No, why would I want to do that. I’ll just flip through all of these aimlessly until I find something I can tolerate for the next two hours… I mean no, wait. Help me find what I’m looking for, dammit! Well, OK. I’ve used enough apps between the iPhone and iPad to understand that the experience is often stripped down on the iPhone due to the smaller screen. That’s understandable. What about if I do the same search on the iPad? Well… um… that’s… a little better… I guess… than the iPhone experience. This is actually pretty close to what you get when you visit Netflix on the Apple TV, as well, and is somewhat of an improvement — aesthetically, at least — over the old version of Netflix for iPad. But still… it’s just that person behind the door, or the cutout bin. Open the damn door and let me see for myself what’s in there. Thank you for at least acknowledging that the movie I asked about exists. Thank you for telling me that it’s not available for instant viewing but is available on DVD. Would it be so hard to do that on the mobile apps? 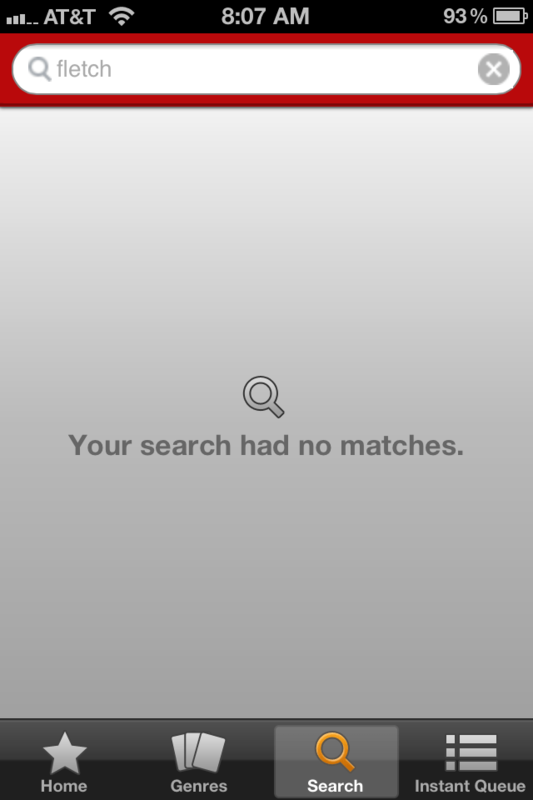 I recognize that DVDs are useless on an iPhone or iPad, but simply providing this information reassures the user that their search worked. Now I can move on with my life. What about browsing? Will you finally just open the door and let me see what’s in the room? At long last, sir, will you please just do that? You may note here that not only am I (after a few extra clicks) able to get a simple, alphabetized list, I am even able to browse subgenres! Who knew such wonders existed? Ultimately, though, whether or not Netflix is deliberately hiding its poor selection behind a mediocre browsing interface, it still has a mediocre browsing interface. Who cares? you say. Just search for what you’re looking for. Have you been reading this at all? I reply. Search, no matter how good it is, by itself is not good enough. Users need to be able to get their bearings, see what’s inside the room. We need an understanding of the scope of information we’re dealing with in order to make a meaningful search, and to make sense of the results we’re given, when we can’t find what we’re looking for. 1. Don’t just rely on having a search box as an excuse not to organize and display your content in an easy-to-browse way. 2. Give meaningful feedback when a search fails. Don’t just tell the user “no results.” That’s obvious. Help them out. Give suggestions for alternate searches. And if there’s anything relevant in your database about the user’s search terms, even if it’s not directly available to them in their current context, at least let them know as much. P.S. As it turns out, Netflix has neither Fletch nor The Sting available for instant viewing. I ended up not watching anything last night, and played around with this synthesizer app instead.